UCEED 2019 : Previous Year and Sample Paper Get Here!! UCEED 2019 : The UCEED is Undergraduate Common Entrance Exam for Design, It is a National Level Entrance Exam. The exam is organized by IIT for admissions in B.Des courses. Latest Update: UCEED 2019 Admit Card Released!! Check the procedure below to download it. Latest Update: Before the exam Check your Preparation via the Previous Year Papers and sample papers. Links are given below. Also Check Latest Syllabus. Latest Update 09 Oct: UCEED 2019 Application Form is Live, Apply Now!!. Latest Update 24 Sept.:UCEED 2019 Notification, Exam dates, and Complete details have been released. The Application Form will be available from 9th October 2018. Through UCEED Admission 2019 can be taken from the exam are acceptable in any of the participating institutes. However for admission in Bachelor Degree program of B. Des. at Indian Institute of Technology Bombay (IITB), Guwahati (IITG) and Design and Manufacturing Jabalpur (IIITDMJ); the qualifying exam is the must. If you are also looking forward to getting the degree in design from the best institute, then improve your knowledge by reading out the extensive information given here. In the article below we have information containing details of exam UCEED Application Form, instructions, exam pattern, syllabus, admit card result and all essential information with respect to these topics. The aspirants of the exam are notified that not just the exam date is vital. Rather just like other national exams it too has a deadline for each event. Here from the tabular form of event, it will be easy to catch the glimpse of all dates to be followed. Qualifying the examination grants admission in best design course offering colleges/institutions. Thus, certain parameters have been regulated as IIT UCEED Admission 2019 Eligibility so that candidates can prepare themselves for the exam. Here are a few of the UCEED Admission Exam Eligibility parameters to be followed by all candidates to appear in the exam. Age Limit: The maximum age of the candidate should not exceed than 25 years if General/OBC and 30 years if SC/ST/PwD. Education Qualification: The applicant should have passed Class XII or equivalent from any stream in 2018 or appearing for 2019 examination. Note: Passouts from previous years are not eligible. Number of Attempts:The candidate can give the exam for maximum two times only. For appearing in the examination, registrations are must of each interested candidate. The UCEED Application Form can be filled online at the official website only. The registration link will be valid only for the notified time. You can know register within the nick of time through the updates of UCEED Registration Last Date and the direct link is given for the same purpose. Go to the website or use the direct link given by us. On the home page, the registration link will be activated. Use valid details to register at the website. Proceed to the UCEED 2019 Application Form and fill correct details. Recheck all fields, as editing is not granted. Click on the submit link and proceed to pay the fee. Choose any one payment method as per your convenience. If a candidate appeared for 2018 but did not qualify it, so can he/ she appear again for UCEED 2019? Yes, He/ She can appear for the UCEED 2019. Just make sure to fulfill all the eligiblity criteria. I made a mistake while filling up the UCEED 2019 Application Form. What should I do? In this case, Send an email to uceed@iitb.ac.in with Complete details (registration number, candidate name, and mobile phone number) and also describe the nature of the mistake clearly. Is there any reservation for OBC Category? No, There is no reservation for OBC Category. ONLY OBC candidates with the NCL (Non-Creamy Layer) certificate can apply under the OBC-NCL category.OBC candidates Without the NCL certificate must have to apply under the OPEN category. A recent color photograph in jpg format. Scanned copy of full signature on white paper jpg format. If 12th qualified, then certificate in Pdf format. Note: If the candidates don’t entitle any eligibility condition as stated, the application form will be rejected. If fees have been submitted it will not be refunded/transferred in any case. Exam Pattern is most important while giving an exam. Whether one is giving it for the first time or not, through exam pattern it is beneficial that how exam can be given. The examination differs than many core engineering or architectural exams conducted at national level. In one single paper, many different sections are there having their different marking scheme. Thus, the following UCEED 2019 Syllabus become more important for each aspirant appearing in exam. UCEED Hall Ticket just like any other exam is crucial for carrying on the day of exams. Here we are providing you all details about the venue allotted, time, schedule and all other important instructions for the exam. 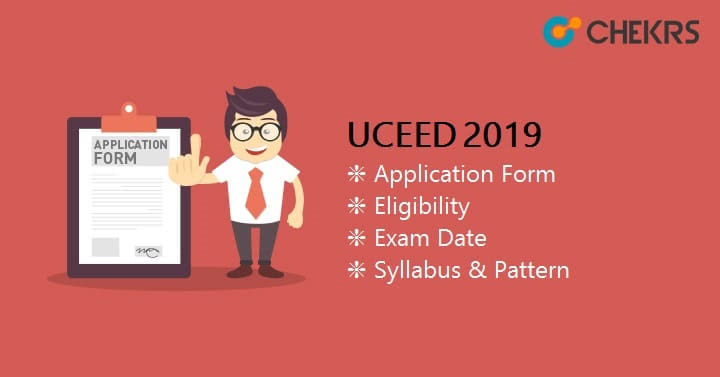 The admit card can be accessed online only but the applicants can make UCEED 2019 Admit Card Download easier through the link provided by us. As the examination is online it will be conducted only at a few test centers in a few cities. As per convenience of nearest place candidates can appear in the exam. However for the same, it is necessary for applicant to choose 3 cities only for UCEED Exam Centres in the order of preference. Thus, check out the list of the cities so that better choices can be made. Ahmedabad, Bengaluru, Bhopal, Bhubaneswar, Chandigarh, Chennai, Delhi, Guwahati, Hyderabad, Jaipur, Lucknow, Kolkata, Mumbai, Nagpur, Patna, Pune, Raipur, Thiruvananthapuram, Thrissur and Vishakhapatna. Note: It is highly instructed to choose city wisely as editing applications will not be entertained. As the examination is online, there is no scope of reviewing the exam. However a draft UCEED 2019 Answer Key will be released by the examination administration to check correct marks on the primary basis. The result will be declared on the basis of correct options given in the answer key. Thus, discrepancies are also resolved but within informed time only. The UCEED Result Date is scheduled to release approximately after a month from the exam date. The results in the form of Scorecards will be updated on the website. The result download can be done by login on the website.Students can eliminate UCEED Admission 2019 Scorecard Download time by using the direct link updated by us. The validity of Scorecard is one year only.